The Vendy Award is the Emmy or Oscar equivalent in the NYC food truck world. Thousands of people buy tickets to the taste-off held on Governor’s Island; winners are selected by them and a panel of celebrity judges that includes chefs, comedians and city officials (what comedians, or for that matter, city officials, have to do with judging food beats me.) 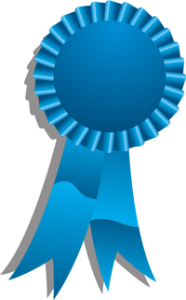 The award ceremony raises funds for the Street Vendor Project, which stands up for vendors’ rights while providing legal and small-business services. SVP is currently campaigning to get the city to remove the cap on food vending permits that has created huge barriers for vendors since it was put in place, at the urging of big businesses, in 1983. There are several Vendy categories: in 2018 there will be awards for Best Rookie, Best Market Vendor, Best Dessert Vendor, and the Vendy Cup. There will also be a People’s Choice Award awarded from among the Vendy Cup category. A friend and I had lunch at the 2017 Vendy Cup winner, DF Nigerian, run by Godshelter Oluwalogbon and his wife Bisola. (DF stands for Divine Flavor). 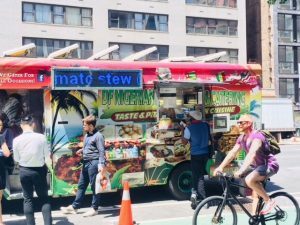 It’s located in front of the Nigerian Consulate on Second Avenue between 44 and 45th streets on weekdays. Advancing to the cart requires a little attention as it’s set just behind a busy bike lane; it wouldn’t do to get killed by a speeding bike en route to your meal. We both had one of the special entrees; for her, chicken, plantains and spicy sauce and for me the same thing with goat in for chicken. (I love goat; during my years at the City Hospital system goat was a frequent offering at Thanksgiving and other celebrations.) Sorry, DF but I won’t be back soon. 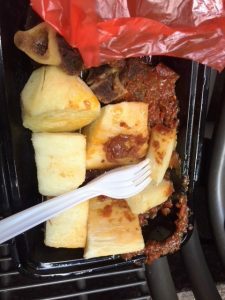 The goat was so tough as to be almost inedible; the plantains bland and the spicy sauce greasy. Of course I spilled some on my white pants. It’s not exactly cheap either; our meals cost $15 each. But we’ll see what wins in 2018 and give that a whirl. Since my goat has been gotten, I will turn to a summery dessert that’s been a long standing hit for years. I have no idea where it originally came from but it’s easy (really), delicious and can be made ahead. 8 slices white (Wonder or similar) bread. Note: do NOT substitute good bread. The mushy quality of Wonder bread makes it ideal. Line 3-cup bowl with plastic wrap, leaving a 2” overlap. Cut circle from one slice of bread to fit bottom of bowl. Remove crusts; cut bread slices in rectangles to line sides of bowl making sure there are no gaps. Press lightly into place. Spoon berries and juice into bread-lined bowl, cover top with remaining slices cut to fit. Fold plastic wrap over bread and top with small flat plate that fits snugly into bowl. Place a weight on plate, refrigerate overnight. Unfold plastic wrap from top of pudding and carefully invert bowl onto serving platter. 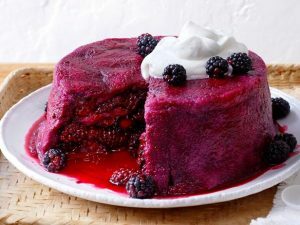 Remove wrapping and garnish pudding with reserved berries. Serve with crème fraiche, ice cream or whatever you like as a topping. Serve rose wine, Cassis and vodka or lemonade and whistle your favorite song. This assumes you can whistle. Or hum. This entry was posted in Uncategorized and tagged berries, bike, chicken, goat. Bookmark the permalink. remember the fresh goat we all had in a small neighborhood “restaurant” more like their kitchen in Naples? Yum not tough, ah memories!! Yes. Good goat is great; this one not so much.